So, I believe a recap is in order. If you want some more back story, you can first go here to find out the prequel and then here to get the first part of this story. Now, where we left off: our young lady had just assisted her dear friend in making her very own Geocities website and left a lovely comment, including hyperlink, in said friend’s “guestbook”. Let’s continue. January 1999 flipped up on the calendar and life seemed to be continuing in the same manner. She had a daily process of checking her guestbook for new entries. Nothing out of the ordinary here, but one day late in the month there was a very nice comment left by a young man by the name of Karl. 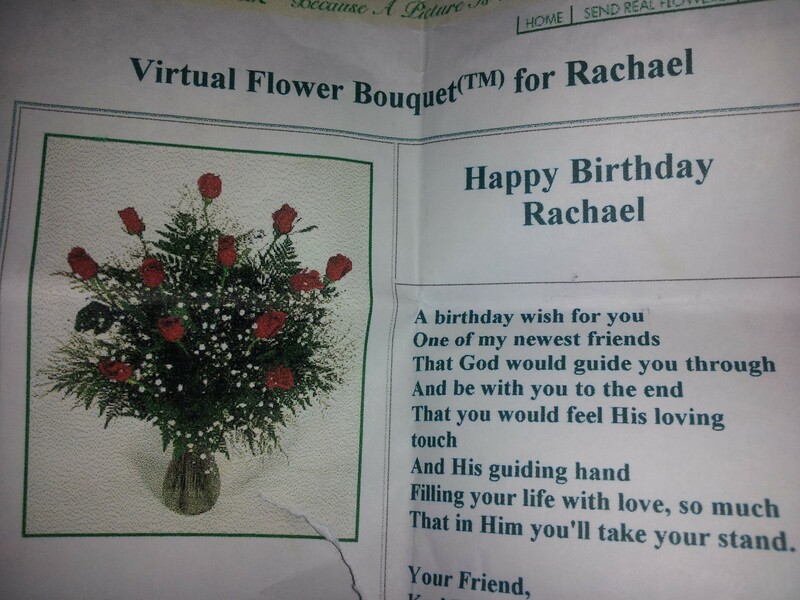 He had left a compliment about Rachael’s page and at the bottom he’d attached a rose with the verse Isaiah 40:31 as part of his signature. This was nothing special or new he’d left for her, just his m.o. But, the gesture had caught her attention. After that, she just had to “check out” his Geocities site. It was intriguing to find his was a bit of an online magazine of sorts, called Karl’s Poetry Corner. He actually had people who submitted their poetry to him.He would put it up on his website, free of charge, showing off their creations and introducing people to the wonder of their creative minds. You can be sure, Rachael was hooked. She was constantly scribbling poems about love, life, and God. Seeing someone take pains to display other people’s poetry online was something she admired right away, feeling that certainly this person was meant to be a friend. They continued to email back and forth over the course of the next few weeks. It was a great friendship, discovering new things about each other. All their letters signed: “YF” your friend. Rachael was so pleased to receive this email (obviously, since she still has it!) and immediately printed it out. She could count on one hand the amount of times anyone had given her flowers. Even on paper, it was special! All of their emails were fun and friendly, full of questions about a million innocent topics. A few months later, the subject line of each letter (now corresponding at least twice a day) morphed into some strange or silly comment or storyline. An example of one is: “The mountain peeks forth its head from the clouds,” and then another, “Where’d the desk come from? I thought we were on a mtn!” Yes, she did reply to his mountain peak peeking out with a writing desk at the top; a place of beauty to be inspired…writing was already one of her happy places. Keep in mind, he was older than her by five years and his first response was, “No.” Rachael wasn’t too pleased and she’s not easily put off, so without another thought she brought it back up again a few letters later. She must have eventually weakened his resolve, because he agreed to stop, since he’d be driving within a relatively short distance of where she lived on his way back home. I won’t tell you that Rachael waited until a week before the scheduled meeting to tell her parents. Oh, I just did. Oops. Anyway, her dad was very upset, but her mom, while not pleased, did not grow angry. Rachael was now 18 after all. I will tell you that Rachael was trying to be somewhat responsible because she wanted them to come with her. It turned out that in the end, only her mom was able to go, but that was fine because it gave Rachael the chance to talk for the hour long drive to where they would meet this new friend in person! Her nerves were tight as violin strings and her voice carried a hurried tune as she poured out her heart to her mom in the car. She and Karl had been talking since the end of January and now it was May 17. Just 4 1/2 months had passed, but so many letters had gone back and forth, it was hard to judge the depth of their relationship. All Rachael knew was she was sure she had feelings for Karl, deep feelings for him. She’d never seen his picture, but she felt like she knew his heart. I’m sure her mother must have been frightened inside, but nothing showed on the outside. Before they’d left their house that fateful day, she spoke to Karl on the phone for the first time. Her excitement could not be contained and come to find out much later, the high-pitched sound of her voice made him fear she was much younger than she’d told him. He was likely ready to run away after that. The car ride was to take Rachael and Mom to a mall where they would meet this young man outside a JC Penny at 10am. I feel a little mean, but I have to work today, so I must pause here for the moment. Maybe I’m dragging on too long, but I love this story! Come back again and I’ll tell you the rest on another day. … now you can click below TO FINISH THE STORY…. I’d love it if you’d leave me a comment. Come back and see me again!